A spray bottle with a spray nozzle. You can purchase these easily online nowadays – some recommended companies in Australia are here and here. I like them because of the affordable pricing and also no minimum order. You can also purchase small spray bottles from most supermarkets too – these are usually aluminum bottles with a trigger spray, about AUD$2.50. Essential oil(s). You can use a single oil, or a blend of several essential oils. If you are a newbie, start with a single oil, or a blend of 2-3 oils. Make sure you have no sensitivities to your selected oils. If you are using around babies and children, make sure you are using kid-safe oils. You can find information on this here. A dispersant: oil and water do not mix, so to make sure your mix does not leave you with undispersed droplets of essential oils on sensitive skin, a dispersant is preferable. You can use a “solubaliser” (this is available from the companies I linked in number 1, or some health stores that also sell essential oils), or ethanol/high-proof vodka. For the occasional home user, you can use plain castille soap. A preservative: this is highly recommended, because water is a great medium for growing nasties like bacteria, mold and fungi. Even distilled water from a brand new bottle, can grow those nasties if left long enough. You can purchase a preservative from one of the companies I linked in number 1. Ethanol/high-proof vodka is also a preservative at 40% of your final product. You can opt not to use a preservative, but be mindful to use your spray within one week, or store in the refridgerator and use within 2-3 weeks. This is where I recommend using a smaller spray bottle, something that is about 50ml, so you don’t end up throwing product away. Step 1: Add 20 drops in total of essential oil(s) into the bottle.I have provided some formulas for essential oil blends below. Step 2: Depending on your choice of Dispersant, add 10-20 drops of solubaliser, OR 2-3 drops of castille soap. If you are using ethanol or high-proof vodka, add 20ml. Step 3: If you are using a Preservative, follow the instructions for use. Most effective preservatives on the market require 0.5-2% of the total volume, so essentially you would be looking at 5-40 DROPS of preservative in your 50ml bottle. You can find effective preserving systems that are considered natural in the cosmetics industry, so not all preservatives (chemicals) are bad for you! However, cosmetic products that do not have effective preservative systems CAN harbour dangerous bacteria, mold or fungi, and I can tell you antibiotics to treat THOSE are worse than preservatives. If you are using ethanol or high-proof vodka as your solubaliser, it will do the job of preserving your spray, although I would still put a short shelf-life on it. Step 4: Swirl, then top up with cooled boiled water or distilled water. Put the spray nozzle on, shake well, and spray about you or around your space. To fill a 100ml bottle, double the recipe above. *Be aware that some people may be sensitive to alcohol on the skin, so watch out for sensitivities. If you are using alcohol, not spraying directly on sensitive facial skin is a good idea. 1. Aren’t essential oils antiviral and antibacterial? Won’t they preserve the product? Pure or not, essential oils are volatile organic compounds made up of mainly hydrogen and carbon atoms. Most of these molecules are hydrophobic – meaning they do not mix with water. SOME parts of the molecules may dissolve in water, but the majority will not. It is why when you leave your oil and water mix for a while, the oil settles at the top of the water. Shaking the crap out of it will help mix it up, but not fully. The oil and water will eventually separate. 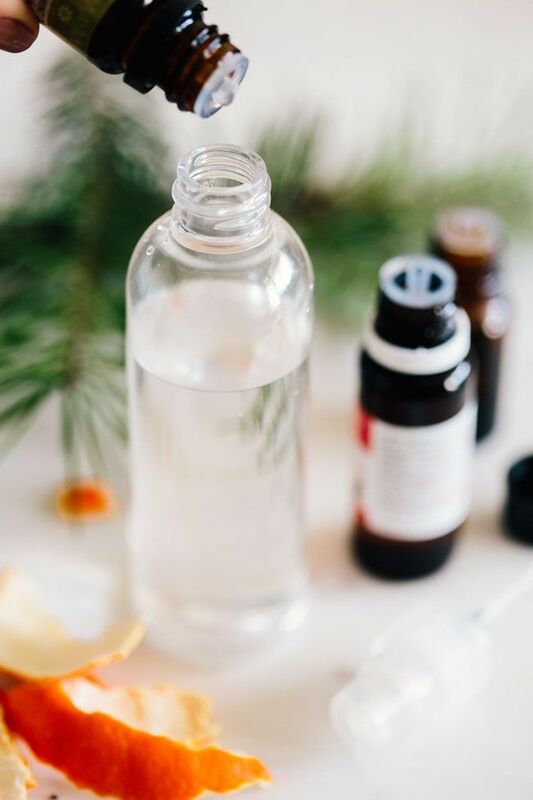 Shaking it before use each time can minimise skin sensitisation, but if we are using essential oils that are phototoxic, or contain skin-sensitising molecules, we may still get droplets of essential oils on our skin, which may harm us. For example, we use lemon essential oil or limonene compounds in spray products to degrease surfaces. If they are effective enough to degrease surfaces, they are effective enough to affect our skin, which is made up of lipids (fats). 3. My oils are so pure, they cannot cause sensitisation. Some detoxing may occur, but it is not sensitisation. Skin sensitisation is very real – it can also happen with essential oils that are generally known as safe, like lavender or chamomile. Skin sensitisation can occur in your first use, or it can occur after prolonged and repeated use, safely diluted or not. While purity is important, and skin sensitisation is more likely to occur with adulterated oils or oils that have been poorly stored leading to oxidisation, people have reported sensitisation to pure essential oils. Once sensitisation occurs, it is likely you may not be able to continue using that oil, and in serious cases, it can extend to other essential oils that contain similar chemical constituents as the one you are sensitised to. So my perspective is, keep to safe dilutions, regardless of purity, so you can continue to use those essential oils. You can read more about sensitisation here, here, and here. 4. Can I use honey as a dispersant and preservative? No. Although honey is antibacterial, its properties do not extend to preserving a product, especially one that contains water. When honey is added to water, it is actually a sugary environment perfect for bacterial growth. While it CAN help disperse essential oils, you will still need a really good preservative. Read this blog as it explains it so much better than I (the bloggist is a cosmetic formulator highly regarded in cosmetic formulation circles). 5. Can I use Epsom salts, glycerine or bicarb soda as a dispersant? Some older aromatherapy texts do suggest Epsom salts, glycerine or bicarb soda as a dispersant. While these changes the “wetness” of water, meaning they weaken the water bonds so they may “blend” better with essential oils, they are still not effective dispersants. Personally, for home use to make aromatherapy sprays, they may be adequate substitutes, because you are not using high amounts of essential oils and you are not spraying profusely. Just avoid spraying on sensitive facial skin or on children and babies. If you wish to read more about dispersants, this is a good article written in by the Tisserand Institute in partnership with Deborah Kallevig, a cosmetic formulator. The article is specifically about dispersing essential oils in bath water, but it explains beautifully how to effectively (and not) disperse oils in water. I hope I have not scared you off making aromatherapy sprays, after all of those cautions! It seriously is a simple process, granted more simple than the safety considerations, but I truly wish to leave you with the idea that essential oils are wonderful and therapeutic CHEMICALS that can heal AND harm. Simply be aware of risks, and aim to use essential oils safely, and you are good to go! If you have any questions, feel free to ask/comment, I will do my best to answer. For a list of Kid-Safe Essential Oils, go here.